I was solving an astronomy problem which said "south of due west." This could be interpreted in two different ways and I don't know which one is correct. Is 'south of' in that phrase an idiom? Or does it mean southwest? The Sun rises north of due east and sets south of due west. Which statement best describes the position of the Sun at sunrise and sunset as seen by an observer in northern hemisphere on June 21? Look at a compass rose. Look at W for west. Now move 'southwards', which is anticlockwise1 in this case, from the point for west. Somewhere in that region is "south of due west". You would expect it to be no nearer south than it is to west, as that would be "west of due south". Conventions vary, but I would tend to interpret "south of due west" WSW, or west-south-west, which is actually due west of south west. 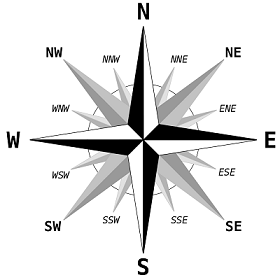 It might mean south-west, of course, or if you use a traditional mariner's compass (the compass rose of which has another degree of subdivision, for a total of 32 points), it might mean "west by south" (WbS), the point between W and WSW. Unless you have a clear idea of what the conventions of the text are, it could be any point anticlockwise of west and not anticlockwise of south-west. 1: In this case it is anticlockwise; 'southwards' from east would be clockwise. Although it could technically be anywhere between W and S, I would interpret that as being significantly closer to W than S. Probably somewhere between W and WSW. Because it's in an astronomy context, there is a possible reason for this wording over "west-south-west" or "southwest". This could be not just a location, but directions on how to find it. Instead of trying to give a more precise compass direction, the phrase implies that you locate the celestial body in question by first looking due west, then slowly rotating your gaze/binoculars/telescope southwards until you come to the first body that matches the description of the body you're looking for. So one might write "Betelgeuse is a red star that sets at 9:08 pm local time, South of due West." The intention is if a reader of that sentence wants to find Betelgeuse in the sky, they would go outside on a clear night at about 8:45 pm, locate due West, look in that direction and then start scanning to the South (left) of that point for a red star. It's actually more helpful to locate stars by intentionally missing to one side and then knowing to look to the left or right of a compass point than it is to try to point at it directly. If you are trying to locate Betelgeuse (for example) by just pointing directly at it, and you don't see it, you don't know whether to scan left or right for it. If you deliberately start off at a point definitely to the right or left of what you're looking for, you always know which direction to scan in. Also, if you don't see it in your scan, you can go back to your reference point and start scanning outwards again, knowing that there's essentially "half the sky" you can ignore. The same technique is used in some kinds of navigation/orienteering, and I remember seeing a question about that on the Outdoors Stack Exchange. This answer might belong here but a bit of astronomy is required in order to answer the question correctly. In New York City, the sun will rise at an azimuth of 57.5°, which is between north-east and east-north-east. In Bogotá, the sun will rise at 66.5°, which is close to east-north-east. In Reykjavik, the sun will rise at 19°, which is between north and north-north-east. Replying "east" or "north-east" would be wrong for a majority of the observers in the northern hemisphere. What those positions have in common though, is that they are "north of due east", meaning that they're somewhere between north and east, but not necessarily north-east. It also means that it's probable that the exact position is closer to east than to north. What is the meaning of “due allowance”? What does “due to” mean? What does due in mean? What does “as due to one's actions” mean?